The brownish cloud known as Arctic haze, produced by industrial activities and coal burning in faraway sites in Asia and Europe, has long been recognized as a pollutant fouling North Slope skies. But how important is the air pollution that comes from a much closer source — the North Slope oil fields? A new study tracking tiny chemical particles that drift to Utqiaġvik — formerly Barrow — from Prudhoe Bay gives some clues. The study, published in the journal Atmospheric Environment, found that Prudhoe Bay is a significant component of the very tiny particles that are suspended in the air of the North Slope's largest community, Utqiaġvik. The study tracked winds, atmospheric chemistry and the occurrence of what are known as "particle-growth events" in which particles are expanded when gases adhere to them. The measurements were made from 2008 to 2015 at the U.S. National Oceanic and Atmospheric Administration's Barrow Observatory. Even though winds blow to Utqiaġvik from Prudhoe Bay only 8 percent of the time — compared to the 72 percent of the time when winds are blowing in from the Arctic Ocean — Prudhoe Bay winds account for a third of the particle-growth events measured at the observatory. 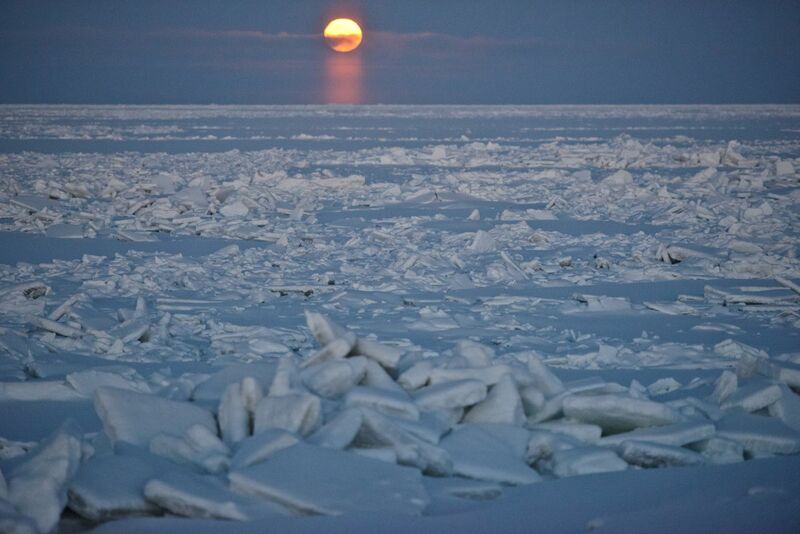 "Which means there are unique gases and particles coming from Prudhoe Bay, more than from the ocean, that is making it possible for these small particles to exist and to grow," co-author Kerri Pratt, a University of Michigan chemistry professor whose lab is studying interactions between the atmosphere, snow and sea ice, said in an email. While enforcement of air-quality rules often focuses on particulate matter that is up to 10 micrometers in diameter, known as PM 10, or matter that is up to 2.5 micrometers in diameter, known as PM 2.5, the particles Pratt and her colleagues analyzed were much smaller. They ranged from 0.01 micrometers to 0.08 micrometers, she said. When gases attached to and expanded them, they typically grew by 0.01 to 0.04 micrometers, she said. Ultrafine particles are defined by the EPA as being smaller than 1 micrometer (100 nanometers) in diameter, and they can be especially dangerous to human health because they are readily passed from the lungs into the bloodstream, according to the American Lung Association. The Utqiaġvik particle-growth events tracked in the study peaked in June, the month with the most sunlight and the least influence from long-range atmospheric transport, making it even more likely the pollution is coming from the North Slope oil fields. As the Arctic warms and thaws and as oil development spreads, more of these tiny particles are likely to be emitted, with more of the oil-industry gases attaching to them in particle-growth events, the study said. There are also implications for enhanced warming. Because these particles can grow to a size affecting cloud formation, and because clouds can affect atmospheric heat and ice and snow melt, "the total climate effects on the Arctic will likely be amplified," the study said. Sources of particles in the Arctic atmosphere, from the coarse PM 10 particulates to the ultrafine particles tracked in the study, are diverse. They include human sources like fuel combustion at industrial sites and natural forces like sea spray from breaking waves, according to the study. Tracking overall North Slope air pollution can be difficult. Some emissions sources have permits and operators submit reports to government agencies, but others are not, so their emissions have to be estimated. Pollution from faraway sites can complicate the analysis. Still, there have been some relatively new reports that summarize total emissions from North Slope oil operations. Onshore oil operations are, by far, the dominant source of air-pollution emissions on the North Slope, according to a 2014 analysis by the U.S. Bureau of Ocean Energy Management, which now has air-quality permitting authority for oil and gas operations in federal offshore areas. Loads of some air pollutants on the North Slope are considerable and comparable to those of some major cities with heavy auto traffic, according to the BOEM report and EPA records. The 44,134 tons of nitrogen oxides that BOEM estimates is pumped into the air annually from onshore oil and related operations on the North Slope exceeds the 2014 emissions in Texas' Dallas County and is similar to the load produced by all mobile sources in Seattle's King County, Washington, according to EPA's national air emissions inventory.